A Japanese research team will soon test the first small-scale experiment of a space elevator in orbit. If successful, it could pave the way for larger, more adventurous studies. To test space elevator technology, a team from Japanese institutions will soon launch a miniature version into Earth’s orbit. A space elevator is a futuristic technology promised to democratize access to space via gigantic structures that connect Earth to a space station in geostationary orbit. As a concept, space elevators dates back to the 19th century. In 1895, Konstantin Tsiolkovsky, a Russian rocket science pioneer, saw the Eiffel Tower in Paris, which sparked the crazy idea of a space elevator in his mind. Tsiolkovsky imagined a cable system that goes thousands of kilometers to a station in GEO orbit and proposed his conception of such a project. The idea remained the same, but the “design” has changed as science advanced, especially over the last two decades. For example, the state at which nanotech is now, and its future promises, makes the concept of space elevators more feasible, scientifically speaking. One of the most serious takes at space elevator technology comes from Japan, where several institutions, led by Shizuoka University, are preparing to test a mini version of a space elevator system. The Japanese team seems to be moving past the conceptual stage with its announced tests of a mini space elevator, which is “going to be the world’s first experiment to test elevator movement in space”. The mini-elevator will be launched on September 11 by JAXA’s H-IIB rocket. This scale model is comprised of two small cubesats measuring 4 inches on each side, connected by a 33-foot-long steel cable. Also contributing to the project is construction company Obayashi Corp, which has been working on its own space elevator architecture. In 2012, the Obayashi Corporation said it was setting up plans to make space elevators a reality, and to send the first tourists, by 2050. 2050 sounds like a far-off deadline to watch for, but considering all the technical and financial challenges of such a project, it’s relatively realistic. 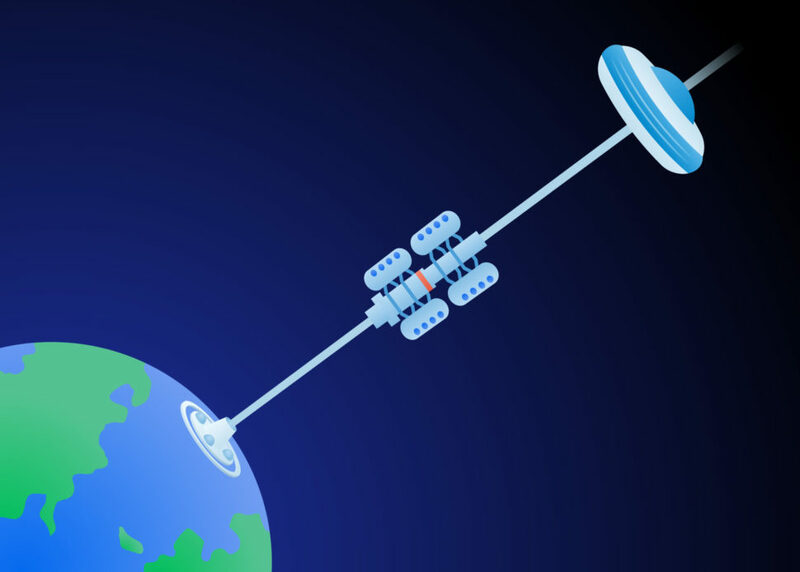 Which other space elevator projects are getting ahead in their conception?